Ames Laboratory is a government-owned, contractor-operated research facility of the US Department of Energy that is run by Iowa State University. StandardsPortal is an online resource designed to facilitate trade through increased transparency and engagement in standards, regulations and conformity assessment activities (SRC). Argonne’s mission is to serve the US Department of Energy (DOE) and national security by advancing the frontiers of knowledge, by creating and operating forefront scientific user facilities, and by providing innovative and effective approaches and solutions to energy, environmental, and security challenges to national and global well-being, in the near and long term, as a contributing member of the DOE laboratory system. AVS is a nonprofit organization that promotes communication, education, networking, recommended practices, research, and the dissemination of knowledge on an international scale, in the application of vacuum and other controlled environments to understand and develop interfaces, new materials, processes, and devices through the interaction of science and technology. Brookhaven National Laboratory’s role for the DOE is to produce excellent science and advanced technology with the cooperation, support, and appropriate involvement of our scientific and local communities. CERN is the world’s largest particle physics center. CERN is a laboratory where scientists unite to study the building blocks of matter and the forces that hold them together. CERN exists primarily to provide them with the necessary tools . These are accelerators, which accelerate particles to almost the speed of light and detectors to make the particles visible. EMC Testing Laboratories, Inc.’s staff and engineers are committed to providing the manufacturer with the highest quality service and assistance in attaining compliance with recognized testing standards and governmental regulations. IDEMA is an international not-for-profit trade association that represents the $22 billion HDD industry and its infrastructure. Founded in 1986, IDEMA provides more than 500 corporate and individual members worldwide with trade shows, technical conferences, symposia, education classes, networking events, and an active international standards program. The IEEE EMC (Electromagnetic Compatibility) Society’s field of interest is on engineering related to the electromagnetic environmental effects of systems to be compatible with themselves and their intended operating environment. The IEEE, a non-profit organization,Â is the world’s leading professional association for the advancement of technology. The IMA is the worldwide trade association representing manufacturers of magnetic materials, distributors and fabricators, suppliers to the magnetics industry and others with an interest in magnetics. Berkeley Lab conducts unclassified research across a wide range of scientific disciplines with key efforts in fundamental studies of the universe; quantitative biology; nanoscience; new energy systems and environmental solutions; and the use of integrated computing as a tool for discovery. It is organized into 17 scientific divisions and hosts four DOE national user facilities. The MPIF is a “not-for-profit association” formed by the PM industry to advance the interests of the metal powder producing and consuming industries. As its name states, it is a federation of trade associations -six in all-that are concerned with some aspect of powder metallurgy, metal powders, or particulate materials. The National High Magnetic Field Laboratory’s magnets offer the highest magnetic fields for use by the international community of scientific visitors. 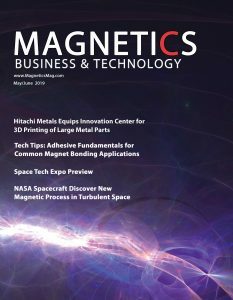 Many of its magnets and experimental techniques are highly specialized, yet broadly applicable to research in physics, materials science, chemistry, biochemistry, biology and even biomedicine. NIST is a non-regulatory federal agency within the US Department of Commerce. NIST’s mission is to promote US innovation and industrial competitiveness by advancing measurement science, standards, and technology in ways that enhance economic security and improve our quality of life. The SMMA is a manufacturing trade association whose core membership is electric motor and motion control companies. The membership of more than 120 also includes suppliers, users and associated businesses such as consultants, universities, and distributors. Markets served, both consumer and commercial, include appliances, transportation, medical equipment, aerospace, office automation/computers and industrial automation. TMR provides market intelligence, commentary and analysis on critical and strategic materials such as the rare earths, graphite and other technology metals & materials. They help companies, agencies and individuals do their homework on the challenges and opportunities associated with these materials. The UK Magnetics Society is an international organization that represents both industrial and academic interests in all fields of magnetics. The Society organizes a number of seminars every year. The organization of on a wide range of subjects promoting information exchange and networking opportunities, bring together acedemic and industrial participants.